Camera Clipping allows you to discard items that are not visible to the camera, or too far away. This proves especially useful when scattering huge numbers of items. First, select a scene in the Scene camera rollout. The camera of the selected scene will be used to check the visibility and distance. If you let the default "None", the current view will be used. When enabling this option, every scattered item that is outside the camera field of view will be discarded. You have two parameters that will help keeping items which are overlapping with the limit of the FOV, or that are outside the FOV but casting shadows in front of the camera. 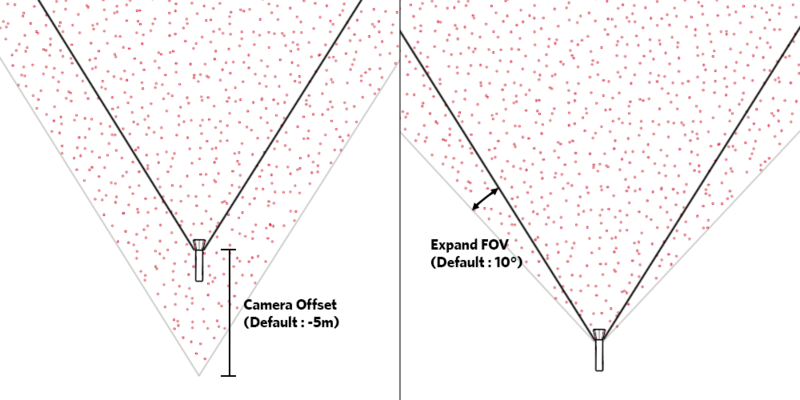 "Expand FOV", in degrees, will make the field of view bigger when computing if items are visible to the camera or not. "Camera Offset", in model units, will virtually move the camera backward. This is especially useful for foreground items. 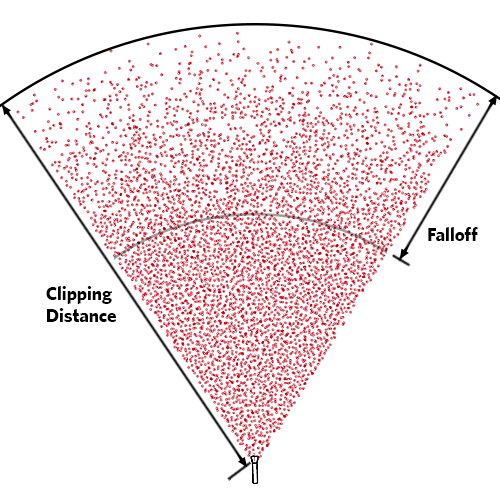 Scattered items that are further away from the camera than the "Clipping Distance" will be discarded. The "Falloff" parameter will decrease density as we move away from the camera.